Fergana is one of the most beautiful, modern cities that left a remarkable history in Uzbekistan. The city is on the southern edge of the Fergana Valley located in Central Asia's southeast corner. Most people around the world recognize Fergana with its eminent history. Millions of years ago, the valley was fully quagmire, but people endeavored to make this land as beautiful as paradise by growing limitless plane trees. These facts make the valley stand out from the crowd and people admit that it is one of the shadiest cities in Uzbekistan. However, a person can feel the importance of trees in summer when a cool wind touches his or her hair and gives a sense of spring weather. Besides, it is not only about the land and weather; moreover, Fergana is famous for its hospitable and warm-hearted citizens. The Fergana Valley is the land of hereditary artisans who have retained the ancient secrets of the manual production of silk and original ceramics until now. People can watch the process of making famous handmade khan-atlas satin using ancient technologies, and see the village of Rishtan, Uzbekistan’s main ceramic pottery. The Yodgorlik Silk Factory is a place hidden in a maze in the city of Margilan, which is one of the oldest cities in Uzbekistan located in the Fergana Valley. Although nowadays more and more tourists come to this place, it still preserves its magical atmosphere. As you pass through consequent production halls, you may appreciate the whole process of the manual production of silk. It is arduous work but it brings amazing results. It is the only one which still preserves the old tradition of hand-made manufacturing of silk. Nowadays, the designers of Uzbekistan are endeavoring to preserve that tradition through making trendy and beautiful clothes from Atlas. 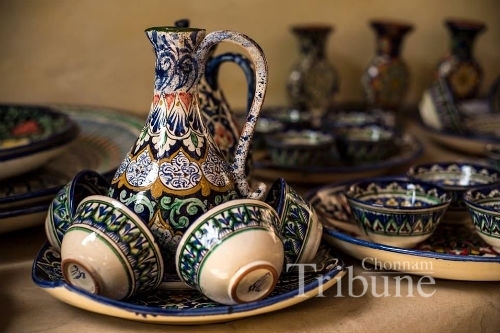 In Rishtan, a small valley of Fergana, blue ceramics are still produced, and it has also contributed to the development of the pottery in other countries as well. Nowadays, hundreds of families are involved in this production and they are trying their best in order not to lose the value of Uzbek traditions. There are many different types of potteries; some masters prefer to make utensils for the household or others make statues and traditional characters of Uzbekistan. The Fergana Valley Ceramics are different from other ceramics with their quality and affordable prices. Fergana is not only prominent with its rich history, but also well-known for its modern life-style. The city is now an important industrial center in Uzbekistan. Over the past few years in the city there are many modern facilities - luxurious high-rise hotels, a beautiful tennis court, an indoor urban market, a stadium, a large park with flower beds and fountains. Although there is no ancient architecture or historical monuments, the city is very picturesque and has its own unique look. The city government has turned Fergana into a huge adorable garden where tourists can have the best vacation ever. In every local community there are amusement parks with different kinds of swings and concerts that make the atmosphere wonderful. After witnessing this beauty, one might understand the real value of life, it is not only about studying a lot or earning money but it is all about the wellbeing of people. In addition, there are many activities that the citizens of Fergana are usually busy with. For example, men are keen to have a heavy meal with their friends once a week. They prefer to get together in a traditional teahouse (Chayxona) and simple places. In Chayxona, men like to eat palov full of meat and drink hot tea, even if the temperature is 45 °C outside. They can see how beer is brewed and taste different types of beer until they are satisfied. Mostly, women in Fergana are very feminine and they adore taking care of themselves. At least once a week, they go out to have dinner with their buddies in famous restaurants. There are hundreds of restaurants, however the majority go to Traktir which is one of the best places to have a meal among friends. Traktir has been operating for many years and people are not fed up with the menu. The colorful menu makes a person order a full table of food, but after a bowl of soup they cannot proceed eating. There is also a strongly recommended restaurant in the center of Fergana. The name is Emirates. It includes various dishes and even international dishes. They do not only serve food but there it is possible to choose different kinds of cakes and biscuits. 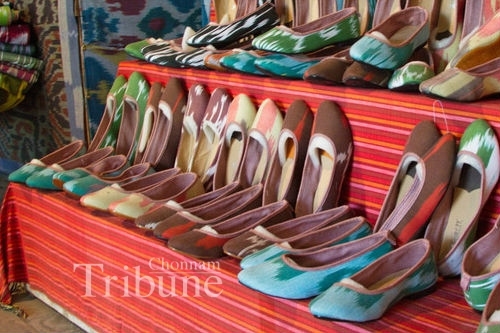 Uzbeks are really into buying trendy dresses and high heels. Therefore, there are thousands of shopping malls and hypermarkets in the Fergana Valley. It is common to go to hypermarkets where they can choose trendy clothes from their beloved brands. Other than that people love Fergana’s beauty salons, because they are super cheap and are satisfied with the stylists’ work. In addition, there are many traditional markets (bazaar) where people can find vegetables and fruits in the open market. People get up early at four a.m. and sell their own products there. As a person goes through, he or she can hear the loud noises of sellers persuading people to buy their products. The most interesting thing about the bazaar is being able to decrease the price by arguing with the seller, so it is reasonable to go to the bazaar and save up a lot money to have more time to travel around Uzbekistan. Fergana is full of interesting facts and myths. The elderly say that in the past because gorgeous women lived in Fergana that people from other countries thought that they were Fairies and all men were mesmerized by their beauty. 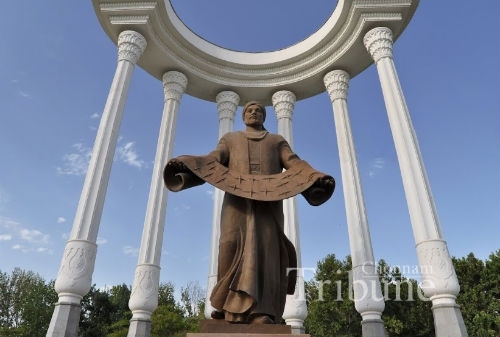 Therefore, still people call Fergana “Angels’ land”. It is worth visiting because of the above-mentioned features. Even though there are not enough historical monuments people can find more trendy places to have some quality time with their loved ones.